Review: Intensity, a fast pace, thrilling, unthinkable. These words describe the events of Escape from Mr. Lemoncello's Library. Chris Grabenstein includes all the necessary elements for an entertaining realistic fiction book. When Kyle finds out that the world famous game maker, Luigi Lemoncello, has designed the new library and is hosting a lock-in, he wants to be there. He soon finds out he has gotten himself into something greater than just a library lock-in when he is pitted against 11 other contestants in a race to win the role of promoting Lemoncello gear. The contestants must find clues to solve puzzles in order to escape from the library. 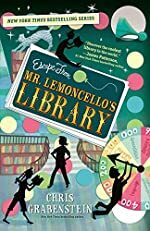 Escape from Mr. Lemoncello's Library is a 5 star book because the suspense kept me reading until the end. I wanted to find out if Kyle would win or not. The clues were elaborate and challenging to figure out, and the characters, events and setting are very realistic. The details are so vivid; it was as if I was standing there watching Kyle the whole time. All in all, Chris Grabenstein's book Escape from Mr. Lemoncello's Library is fun and action-packed, suitable for kids ten and up. We would like to thank Raab Associates for providing a copy of Escape from Mr. Lemoncello's Library for this review.